Alfalfa, or lucerne, is most used as animal feed but is equally nutritious for humans, since it contains considerable levels of protein, vitamins C, E, K, magnesium, calcium, and beta-carotene. Traditionally it has been used as a natural food supplement for debility and convalescence, aiding appetite and weight gain. Use 5-10g (0.2-0.5oz) steeped strained tea, three times a day for high cholesterol. Take 5-10ml of the tincture (1:1 in 25% alcohol) three times a day. Available in commercial products. Follow the recommended dosage directions of product manufacturer. 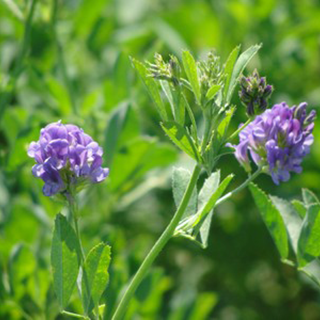 Alfalfa adapts well to nearly any garden and is easily grown and propagated. It tolerates a many different growing conditions and makes a good drought-resistant plant too, as it doesn’t like wet feet. Harvest your alfalfa just before the plant blooms.